It was after eight in the evening and darkness had fallen. I settled in my chair, tapping into the reserve two hours of brainpower to be applied to the craft of reviewing. There came a sharp knock at the front door. Opening it, I saw a silhouetted figure in the darkness (the blasted front light was out! ), “Hi Doug, it’s Jeff.” Jeff…the tree man! I had called him a week prior to grind two tree stumps, and here he was, suggesting that since he was in the neighborhood might he get it done now. I was elated; Jeff’s a great worker, and I knew that if I was flexible it would be done in short order. I had the great responsibility of handling the flashlight as he worked the heavy equipment. Thirty eight minutes later, I was back at the keyboard, resuming my work, with a gleeful feeling of satisfaction that another job was marked off the “To Do” list. I love people who do their work well! It is very satisfying to observe a plumber, service agent, teacher – anyone who puts their heart and soul into the task. An individual I admire, a shadow figure whom I have not yet seen, is Gerhard Hirt, the Chief Designer for Ayon Audio. I have heard his “voice” only through the components he has designed, but it is a voice that seems to speak with eloquence. Allow me to share with you the message that one particular player, the Ayon Audio CD-3, conveys. In the spring of 2008, I was pleasantly surprised by Bill Dudleston of Legacy Audio’s offer to review his flagship speaker, the Helix. In assessing the needs for attending components with which to review the Helix, I returned to manufacturers and distributors whose products impressed me and I sought their best equipment. I determined to write a “Super-review”, a series of reviews which dovetail by overlapping coverage of the system’s components. I wanted to work with a source that would be fitting, so immediately I contacted Charlie Harrison of Ayon Audio USA, the U.S. distributor for Ayon. 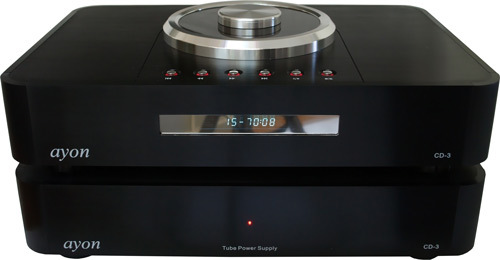 Having enjoyed the Ayon Audio CD-1 previously it was natural to pursue the CD-3 (a two-chassis, top-loading, tube-output design) for the front-end. 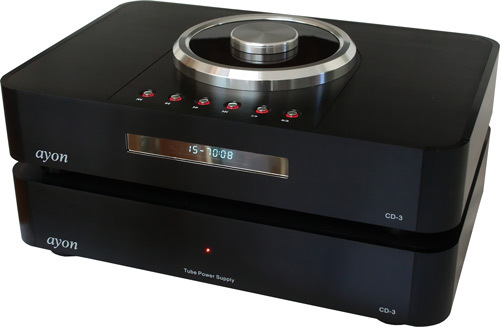 This review highlights not only the Ayon CD-3, but also discusses the working of it in a specific arrangement which I have put together with an eye toward system synergy with the Helix speakers. Aside from the aforementioned Helix and CD-3, the other members of this Super-review set are the Jeff Rowland Capri preamp and MC-606 multi-channel amp, and a suite of Wire World Silver Eclipse 5 Squared and Silver Electra Power Cables. The reader is strongly encouraged to consider the other components in conjunction with the CD-3 as potential partners. Ayon Audio strikes me as a company which is on the ascendancy. Gerhard is young at 45, and already producing components to be reckoned with. He had been designing electronic devices for BMW, as well as working with electrical systems for Ferrari prior to setting out on his own. In 1990, he started his own company, offering his first piece, the Ayon 52 SET amp. Even from the start, Gerhard’s designs garnished attention for their musicality. Not long ago I reviewed the Ayon Spirit integrated, and confirmed that it is an extremely agreeable, economical integrated. Ayon likely would have been able to hold its own by manufacturing amps only, but Gerhard has too much talent to let a large segment of his design skills languish. He wanted to make a CD player, so he entered a cooperative effort with Raysonic. Many audiophiles in touch with current CD player offerings know that the Ayon CD-1 and Raysonic CD128 players are strikingly similar in appearance, including the remote. There is much misunderstanding and misinformation about the players circulating, such as Ayon being a division of Raysonic and inappropriately cross-selling to the U.S., or that the two players are made in the same factory. Neither is true. When the CD-1 was first being developed by Gerhard, he chose to partner with Raysonic. The collaborative effort to have Raysonic manufacture the chassis, not internals, began in 2005 and ended in 2006. Sometimes partnerships are golden, as seems to be the case with Bill Conrad and Lew Johnson, of the ubiquitous Conrad-Johnson. Other times they can be, oh let’s say, problematic. Bill Dudleston resumed ownership of Legacy Audio after a partnership with the Allen Organ Company. Likewise, Gerhard ended the Raysonic partnership in order to pursue his vision. Since then the two players, though outwardly similar, have developed independently. It may look as though all that separates the two players is the eerie blue illumination of the Raysonic 128, but the internals are quite different. Gerhard emphatically points out, “The Ayon CD-1 uses a different upsampler, the Crystal Semiconductor, different regulator, different tubes, different output stage…” There are critical design differences, whereas the CD-1 is 24 bit/192 kHz, the Raysonic 128 is 24 bit/92 kHz. This is but just one of the subtle subtractive differences the casual purchaser will not notice. A consumer should not think that because two units share the same skin they are the same. Caveat emptor applies between seemingly identical products. Understandably Gerhard wants the distinction between Ayon and Raysonic widened, as a similar pattern followed his CD-3, with the Raysonic two-chassis model, the CD228, showing up approximately two years later. He is emphatic, “The new Ayon CD-2 will be released in 2/2009 and there is no relation or collaboration with Raysonic – 100% Ayon Audio, made in Austria.” Gerhard seems quite content lately to have Ayon fly solo; the freshly minted CD-2, which I have just received and will be putting through its paces for its own review, marks a drastic departure from previous designs. I wish him a smooth flight. All Ayon products arrive with the most “bomb-proof” packaging I have encountered in audio. Triple boxed, individually packaged chasses for the CD-3 ensure little possibility of damage. I would be comfortable to ship one of these units in the factory packaging to Tunisia if necessary. A sleight, no-nonsense manual lays out the functions clearly. As was mentioned in the CD-1 review, the remote is a mistake; the mistake is putting too much at the fingertip. I get the feeling Gerhard has to be a techno-dweeb (Hey, it’s not so bad! People I know think I’m one. I just tell myself it’s a comment born of jealousy!) as he has put nearly every conceivable function on the remote. I have been using the remote for a couple months and still have to take a look at it to forward tracks. Ayon needs to consider giving its customers an additional, simple, clean remote with only the critical functions. It will endear the remote-happy user to the player. I will get the only other quibble about this player out of my system. As a reviewer, I sometimes must accept used units, i.e. show units or previously reviewed pieces. This particular player had been used previously, and obviously not with the utmost tenderness and care, which I am learning means “high degree of potential for anomalies.” In this particular case, the transport was noisy, emitting a clicking noise upon reset of the laser. I have no problem with manufacturers and distributors wanting to send me show pieces or previously reviewed units. If I were a manufacturer, I would consider it as well. Occasionally there is a glitch, and the reader should know that this was not a pristine, unopened unit. I only mention it as I have committed to sharing with readers my full experience with the components; rarely have I found as attentive a distributor as Charlie Harrison of Ayon Audio USA. He did an exchange for me pronto, and as expected the new transport operated flawlessly. As a brief physical introduction to the CD-3, it is comprised of twin, horizontal, 8mm black anodized aluminum slabs with smoothly contoured corners. The transport retains the CD-1 top mounted illuminated (in this model red) controls, and flying saucer shaped collar and lid. The smoked Lexan lid is also a carryover from the previous model. In the back, one sees both single-ended and balanced outputs, as well as digital coaxial output. The tube power supply resides under the transport, connected by a seriously thick power umbilical. In an unusual move by Ayon, the umbilical is so short that the units can only be stacked, not set beside each other. However, Ayon does offer a longer umbilical as an option. My guess is that Gerhard has subjectively tested the two options and felt the longer umbilical ever so slightly diminishes the sound, thereby selecting the shorter umbilical as the standard. If that is indeed the case, I’m not sure such a difference would pass the Law of Efficacy. In other words, I’m not sure that the difference would be immediately noticeable and confer a large advantage. If a sonic difference does exist, I estimate that one would need a refined audio system in approximately the $70K range or higher (as a crude measurement of quality) to hear the distinction clearly. The transport of the CD-3 is the same Sony KSS-213Q used in the CD-1. The Crystal Semiconductor chipset yields 24 bit/192 kHz conversion. A matched quad of 6H30 tubes are used in the class A output stage. The highest quality internal components are utilized in the build, including Mundorf capacitors and hand assembly with silver solder. Ayon is working for a reputation of quality, and this is evident with the CD-3. this machine is stopping working, the cd does not turn anymore, the mechanism has been changed, but it is the same, and there is no service after sale, I like this machine, can you tell me how to get the electrical schematics. The CD-3 was released over 9 years ago. Service is available globally. We apologize that your technician was unable to complete the service in France. Perhaps it is best to contact Ayon Audio in Austria. Ayon Audio in Austria will be able to recommend a service center to you in France, or better yet Ayon Audio in Austria can service the unit for you.